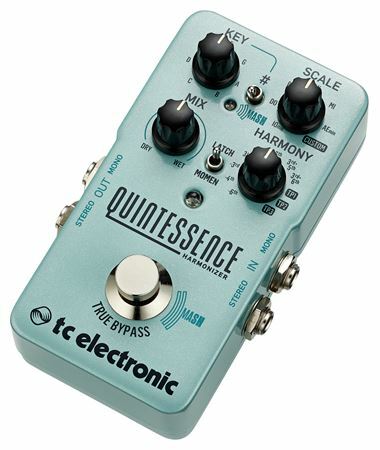 Order your TC Electronic Quintessence Dual Voiced Harmonizer from AMS and enjoy 0% Interest Payment Plans, Free Shipping, Free Extended Warranty & 45 Day Money Back Guarantee. 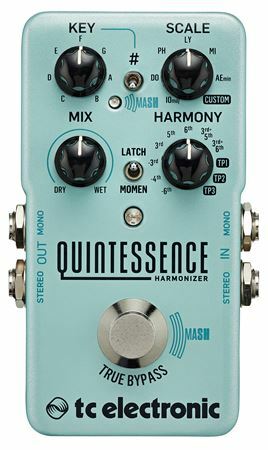 A state-of-the-art intelligent harmonizer pedal, the Quintessence Harmonizer features expressive MASH technology and powerful TonePrint editing. Capable of beefing up your playing in any musical style from country or southern rock harmonies to Thin Lizzy-esque twin riff s and screaming metal leads, Quintessence follows your every whim with perfectly harmonized notes in a wide variety of modes and scales. With MASH, Quintessence can bend the harmonized notes without you moving a finger, momentarily harmonize just a few bars or notes and with our proprietary TonePrint technology you can even choose exotic scales and custom intervals for harmonies. Complex as it may sound, Quintessence sounds simply stunning and its intuitive and straightforward design makes it easy to use. With up to 2 perfectly tracking harmonies and an intuitive, straightforward design, Quintessence simply sounds stunning. 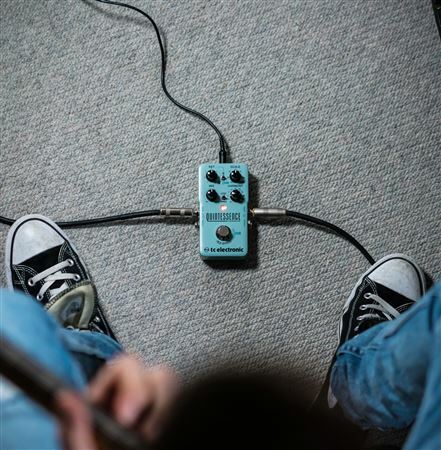 Download the free TonePrint app for Android and iPhone, choose the TonePrint you want to hear and beam it instantly from your phone through your guitar's pickup into your TonePrint pedal. No cables needed! Learn more about beaming TonePrints. MASH Presets; Here is a quick overview of what MASH does in the different Harmony settings. In these positions, MASH has the same effect. It bends up the harmony note to the next interval in the scale. 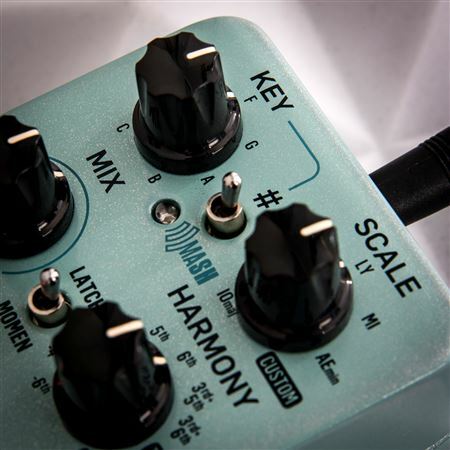 So for example, MASHing while the Harmony knob is on the 3rd up setting, the harmonized 3rd is bent up to the 4th of the scale. In positions 7 and 8, MASH bends both voices up to the next interval. 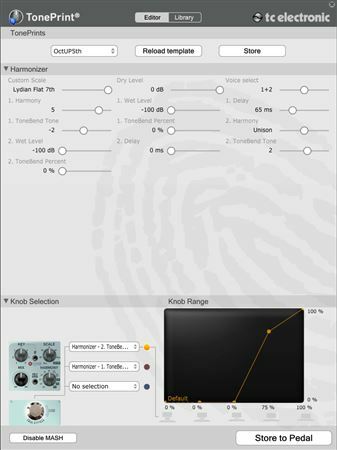 The first TonePrint is for the pedal steel pickers trapped in a guitar players body. A 3rd and a 4th is harmonized and when you MASH, the 3rd is lowered an interval while the 4th stays in place. Setting the Scale knob to Custom puts you in pentatonic major. This one is a bit avant-garde. The harmony is a 4th and a 7th and MASHing bends both harmonies up an interval which essentially lands you in a power chord. The Custom scale setting is takes you to the very dissonant super locrian mode. The last TonePrint is a bit different. The harmony is a 3rd and a 5th but they are delayed individually, resulting in a nice little arpeggio for every note you play. MASHing takes up the harmonies an octave for some hauntingly strange effects. The Custom scale mode sets this TonePrint in an Yngwie-approved harmonic minor. Purchased this for a few specific chores and it hit it out of the park. Many additional possibilities realized. Can’t wait to experiment.